Some 29 genera of which Aphis, Microsiphum, and Myzus are among the most common. Adults are about 1/8-1/4 in. long, rounded; two elongated projections arising from the abdomen. Aphids are sometimes coated with white, cottony wax. 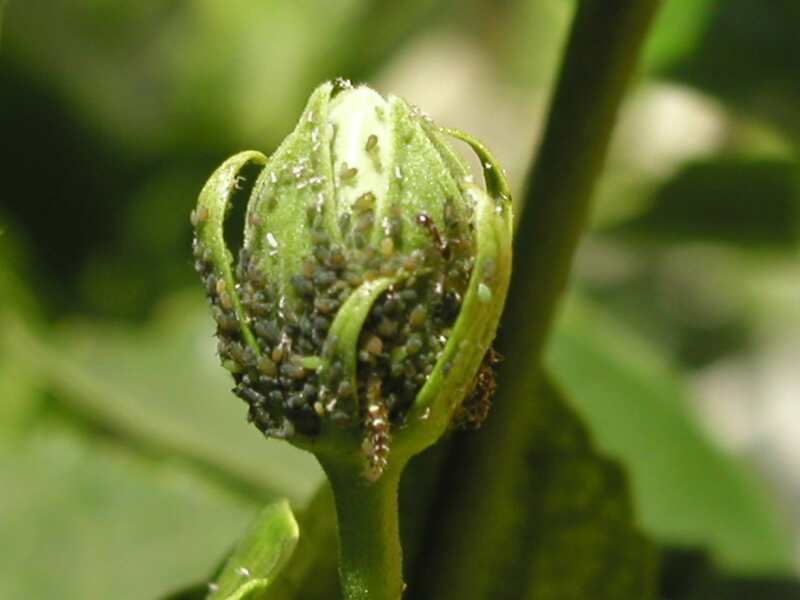 Aphids have many host plants and trees and are spread worldwide. Some are specific to one area. Symptoms include heavy infestations with bud blight, curling and drooping of leaves, chlorosis or light yellow “pin prick” spots on foliage from feeding. Aphids usually cluster to feed on undersides of leaves, often more numerous on inside shaded portions of crown. Dried white skins cast off during molt. A clear, shiny liquid (honeydew) is often seen on the leaf surface of infested plants. Honeydew may drip and is attractive to ants. Black sooty mold forms on leaf surfaces growing on the honeydew. Cool temperatures, vigorous foliage are favored. Most will overwinter in eggs attached to bark crevices or protected plant parts. Nymphs hatch in spring to become wingless adults (stem mothers), which then produce live young (nymphs) in about a week. New generations are created weekly, depending on climate. Three to five (3-5) weeks of conducive conditions can cause severe plant injury. In fall, males and females are produced. Females deposit fertilized eggs on protected plant parts to overwinter. Many are vectors for viruses or mycoplasma.